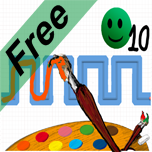 Get your children or students to love completing worksheets and painting with GetWriting! 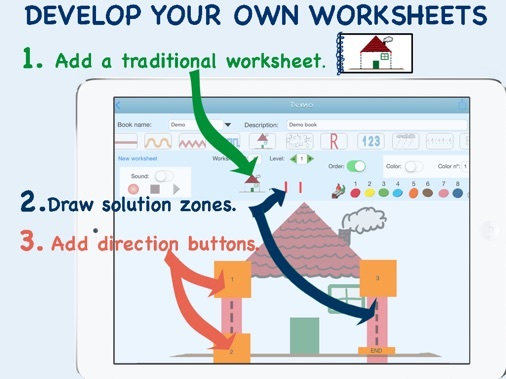 Now you can transform your traditional worksheets into an interactive game for the iPad. This app is designed for use in schools or at home. -Develops lateral and directional skills. When the user writes the wrong way they will automatically be informed. This app can also help users with mixed laterality or cross-dominance. -Develops visual-motor skills and psychomotor skills. -Feedback: This app automatically quantifies the percentage that the user draws over the adequate area and obtains quantitative parameters of writing quality. -An Excel file (CSV) with the user’s scores (time, mistakes, duration, date…) is available with GetWriting and GetWriting-Pro. GetWriting is designed so that parents, teachers, speech-language therapists or psychologists can easily develop their own worksheets. -Add images to previously existing worksheets and draw solution zones. -Add up to 27 users (Available with GetWriting-Pro) or 5 users (GetWriting). -Add invisible direction buttons with the direction you would like the user to take (Seton order button) or to verify that the user has found all possible solutions (Setoff order button). -Send worksheets to other app users. (Available with GetWriting-Pro). -Receive worksheets sent by your teacher or other users. (Available with GetWriting and GetWriting-Pro).